In 1976 a remarkable collection of letters, books, artwork and ephemera was given to the college by a Somerville alumna, Audrey Kennet (née Withers, 1924-7) and her sister Monica. The gift was made in honour of their parents Dr Percy and Mrs Mary Withers (née Summers, Somerville, 1889-92), who were at the centre of an illustrious circle of friends including many of the foremost British writers and visual artists of the inter-war period. This collection has now been fully catalogued for the first time, revealing a significant and intriguing body of work. Percy Withers (1867-1945) was a G.P. before retiring to Souldern Court and then Epwell Mill in Oxfordshire. Although he had literary ambitions he was not conspicuously successful as an author himself; his greatest legacy is in the volume of correspondence left to his daughters. 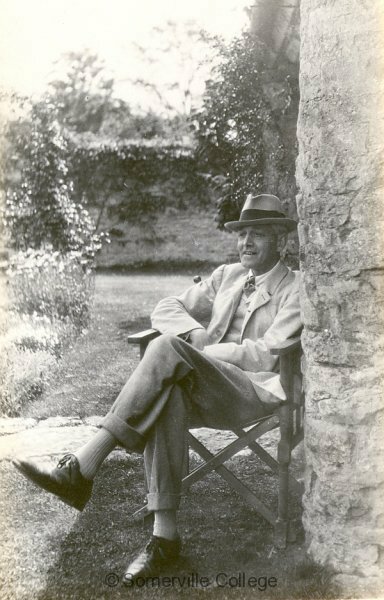 Dr Withers had a rare talent for friendship, and cultivated a distinguished literary and artistic coterie who obviously valued his genuine interest in their work as well as his personal and professional support. Most appear to have had great affection for him – including the famously reserved poet A.E. Housman – and frequently enjoyed the Withers household’s hospitality. This collection presents in a unique light the output, personal relationships and working practices of some of the early 20th century’s most important writers and artists, notably Robert Bridges (some 30 letters), A.E. Housman (66), Walter de la Mare (78) and members of the Dymock group of poets. Their correspondence with Dr Withers is candid, even unguarded, since Withers was neither rival nor critic. He was a connoisseur, however, and in gratitude for his friendship and hospitality he was gifted original artwork and poetry, as well as the confidence of a remarkably wide range of distinguished friends including Max Beerbohm, Edmund Blunden, Marie Corelli, Alice Meynell, William Rothenstein, John and Paul Nash, Graham Sutherland and W.B. Yeats. This entry was posted in Special Collections. Bookmark the permalink. I have a set of Max Beerbohm which I think belonged to Percy Withers and then John Sparrow. However the bookplate for Percy Withers is rather unusual and I wondered if anyone could give me a rough idea of his bookplate so that I can confirm his ownership. I love the set and to have two previous distinguished owners would add enormously to the enjoyment.